Heesen’s latest superyacht, the 49.8-metre all-aluminium, semi-displacement Monaco Wolf, has been delivered to her owners after sea trials in the North Sea, where she exceeded her contractual speed by 0.4 knots, with what the yard reports as “very low levels of noise and vibration”. “During the first day of sea trials we had the chance to test her in Force 3-4 winds and waves around a metre. We met all requirements and the yacht performed well. Monaco Wolf is now ready to be extensively used and enjoyed during the summer season in the Med,” says owner’s representative Howard Lowe from Royale Oceanic. The yacht’s flowing lines are the work of Frank Laupman of Omega Architects, and embody the Heesen family trait of a reverse-sheer pelican-beak bow. The interior design has been created by Francesco Paszkowski. 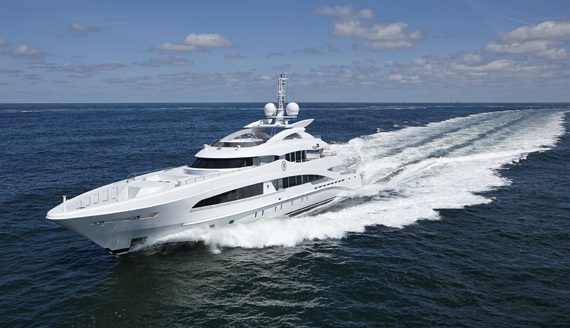 The yacht accommodates 12 guests in a full-beam master suite and study, a full-beam VIP, two doubles and two twins.